Congratulations to Tina McCarty on winning our fifty eighth High Five Giveaway and thank you to all who entered. 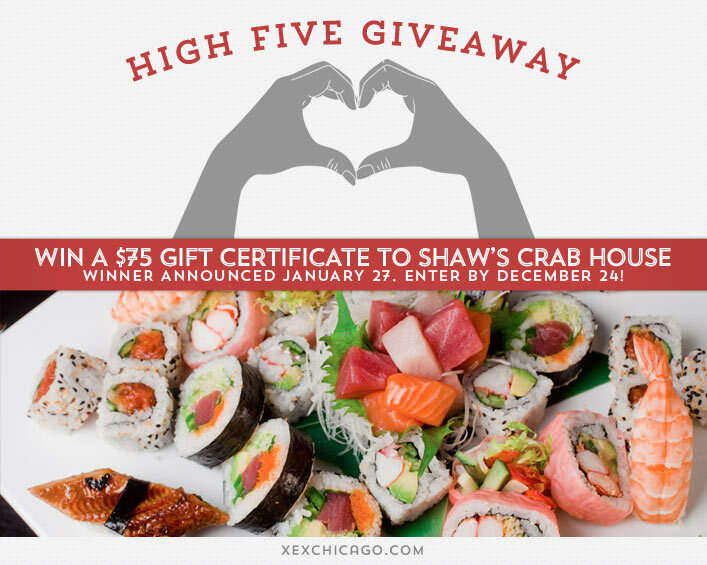 For our next High Five Giveaway, we have a $75 gift certificate to Shaw’s Crab House! Shaw’s is located at 21 East Hubbard Street, Chicago. Visit their website at www.shawscrabhouse.com or call them at 312-527-2722 for more information. For most people, how many times a week should you need to wash your hair? Now, just add a comment to this post with the right answer to be eligible to win! The winner will be announced on Monday, January 27. Entries must be received by midnight on Friday, January 24. Good luck! woohoo, I could get my hair done and then have a night out at Shaws with my husband, how perfect would that be! Twice per week for beautiful hair! Twice a week – especially for hair as curly as mine!